...when it's time to say "Goodbye"
Always a very difficult time, even if it is one that is expected, and not a subject we feel comfortable talking about. But never the less it is something we all come across in our lives, and the card for this needs to be special too, whether shop bought or made by your self. 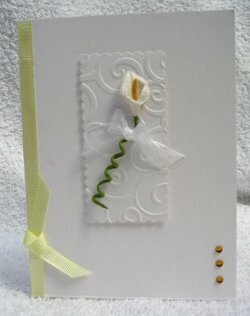 You can make this to suit the recipient, but I find it better to keep the colours neutral and elegant, and the card itself simple. This one is very simple and is just a decoupaged flower matted onto a gold background, and pearls added to the flower centres. Maybe just a single Lily can say all you want it to, on a white background. 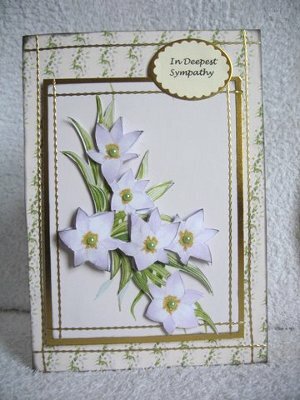 But of course you will know the people to whom you are sending the card, and can adapt yours accordingly. I hope you won't have many times to make them for your self, but it is an occassion that you maybe asked to make a card, for someone else. This is an embossed flower, kept to soft greys and layered onto silver mirror card. The little butterflies are added to acetate and glued on with Pinflair Glue Gel. Very simple,very elegant for a sad occasion.